What are details of moving system of HZQY900T launching gantry? 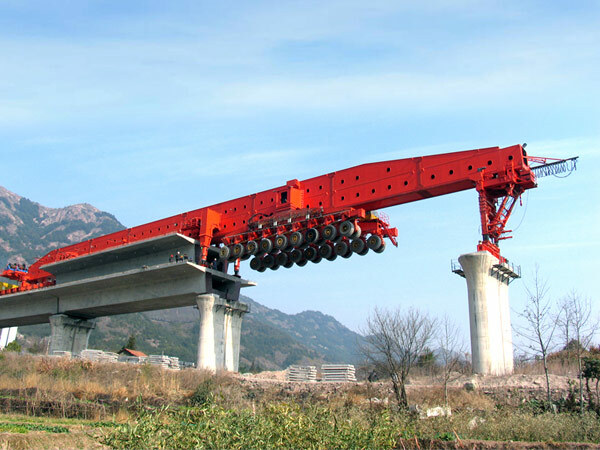 HZQY900T launching gantry is driven by 28 driving wheels (14 sets, 2 for 1 set) for rear vehicle and front vehicle, the driving power device is of a built-in hydraulic motor connected with wheel hubs of all driving wheels by speed reduction gearbox. Hydraulic driving motor is of variable piston motor connected with gear reducer by same shaft. Reduction gearbox has brake device. Parking brake is of normally closed type brake which could ensure a higher brake safety as the motor misses and the complete machine is located on the ramp. All driving motors are in parallel oil supply to ensure a same output torque.